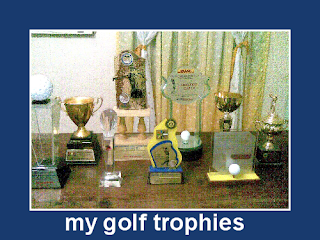 I am a very avid fan of golf. Back in the Philippines I used to play golf at least three times a week. Four years ago, alone in my house in Cebu City, I recall sitting in front of the TV, wearing in my shorts, sipping a refreshing drink, watching the Masters. I have always found myself being strangely fascinated by the game. Until that point I had considered it a game for the rich, for guys only, well-to-do and young. I decided to get of my lazy backside and have a go – is it as addictive as they say? Surely it can’t be that hard to knock a small white ball around a field of trees and sandpits! So, without the first clue in what to do I went to the driving range nearest to my house. There were quite a lot of people that time so I watched a while and decided that I ought to get an equipment and ball before ‘wowing’ everyone with my natural skill. I asked the staff in the pro shop to have a go on the driving range – the staff asked me how many balls I want, “Just the one I replied, “100 or 200? he asked “Oh I see, 100 I said feeling I’d soon get the grip of it. It was only as I left the shop I realized I’d forgotten something, so I returned. Have you got any iron sticks? I inquired.“You mean CLUBS." whatever was my reply. “1, 2,3,4,5,6,7,8, or 9?" he asked again. I was starting to wonder what the obsession was with having a lot of everything. Just 3 I answered. So I walked out with my token, a 3-iron club and went to the range. I put the token in the machine and listened to it make all sorts of strange noises. Bang, gurgle, clunk and then 100 balls started shooting out. It was only at that moment my hawk like vision spotted the baskets in the corner. 100balls continued to shoot out of the machine, over my feet and across the floor. Half an hour later I had picked them up and went to a bay. I positioned myself between two gentlemen. Figuring they couldn’t be that good (gosh how I was wrong!). I put my ball on the tee and prepared to whack the ball as hard as I could. Having been into gym & being athletic for some years I figured I could do as anyone else. However, due to the heat, the energy I’d expended collecting balls and the adrenaline – my hands were a bit sweaty. I swung. I looked up and watched my no 3 club flying 50 yards up the driving range, looking like a giant silver boomerang. It was only after I had to stop people from swinging while I walked in front of them to get it that I realized that golf is harder than it looks. It wasn’t exactly as easy as it looked on TV. Because of the humiliation I brought to myself that day, I was more driven to learn to play golf well and hope that I would be good at it someday. I promised myself never to go hit ball again and humiliate myself like that. Few weeks later, I went home to Gensan and I decided to hire a golf pro in our area to help me with my new found passion. So I went to a golf clinic for a month and one day I told my golf pro Eddie that I want to go and play in the golf course. My first experience of the fairway was in June 3, 2005 in Dole Kalsangi Golf Club. I was so excited, my tee time was 6:30am and I was with my golf pro. I was dressed like a real golfer, had a new set of Callaway Golf clubs, new gold shoes and new golf shirt. In the Phil. you cannot play in any golf course without a caddy, the course management would not allow you to play without. My first caddy was Danny and since then became my regular caddy. I will never forget my score on my first round, it was 115 in a par 72! I was so frustrated because I felt I played terribly. My pro told me it was not a bad score for a first timer with only one month of golf lesson. Deep inside I desired to be good at this sport. Right after that round, I signed in a Golf membership @ Dole Kalsangi. It is an exclusive course and even if you can afford the fee, you cannot be a member without being sponsored by two of the executives of Dole Philippines. Friends in Dole sponsored me & my application was in process, in three days, I got my membership, I felt I was a real golfer...The rest became history. In less than two years I was able to lower my handicap from 32 to 15...Last year before I left, I was handicap 8, I traveled to different places in the Philippines to play in the tournaments. I was playing 70's and when my game was bad, it was between 80-85. I learned that a good golf swing is a combination of many things - equipment, timing, delivery, precision, relaxation, grip, stance and the list goes on. I also learned later that when they come together it’s pure joy – when just one thing is out – it is frustrating. The rule is the same for anything - the right combination, in the right time leads to joy. Get it out of sync and it's painful. Golf teaches me lots of lessons about life. Like fairways and bunkers of a golf course, in life we also encounter turning points, moments of trial when everything accomplished up till then falls away and everything we stand for and believe is summoned forth for thorough examination. Life can be a fascinating mixture of extreme beauty (like fairways and greens)and crushing harshness (like the bunkers and hazards). I do not know if this is everyone's experience, but it has been for me a life of discovery and adversity, where love, success and beauty in all its forms have been a driving fervor. Like playing golf I created a vision for my life and future. Creating a vision is difficult, but once you know what you want for your life, it sets a framework for everything you do. Your circumstances will never get you closer to your goal. Only your vision can guide you to get what you want. I've overcome adversity by looking it full in the eyes and not showing my fear. I've told myself that I am better than that. As best as I could I wouldn't allow myself to have any negative feelings. For with these negative feelings come sadness and sorrow, out of bounds in golf. In any round of golf, it's okay if I bogey one hole, but I always aim at making par or birdie in the next hole. Spring is here, I am excited to hit the fairways again and who knows, I might be in the bunker sometimes. It's okay, I know I will go through some periods where I am not at the top of my game. That doesn't mean that I am going to stay there; that just means that like anything else, it comes in cycles. To me it really isn't what life throws at us that makes us who we are, but rather how we respond to life and the attitude we choose to carry with us. I am glad to be hooked to this game of golf. As my favorite and world's best golfer Tiger Woods said, "Golf has been good to me, but the lessons I've learned transcended the game." wow, a lady golfer from the Phils. . . I'm always fascinated of women with inclination towards sports! It reflects your being competitive and tough.